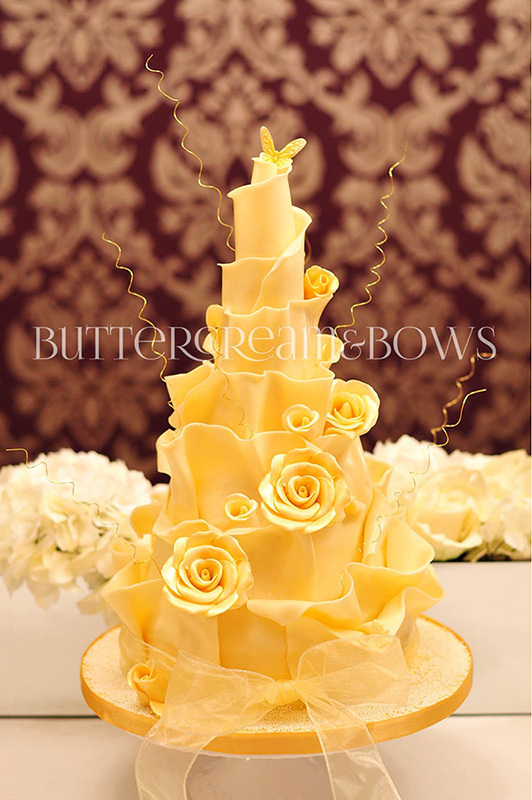 During this One Day class you will produce a stunning White Chocolate Ruffle & Rose 3 Tier Wedding Cake. This is a really desirable and impressive cake for weddings, and also perfect for a special occasion. You will decorate 2 chocolate cakes and 1 dummy cake. The class runs from 10.30 am – 5 pm. Professionally cover and ribbon your board. Learn professional hints and tips of wedding cake design. Understand how to transport and display your wedding cake. All equipment & materials are provided for you, lunch & drinks are also included throughout the day. If you can’t see a suitable date on our site, or want to make a group booking for a Private Party or Hen Do, then please get in touch, as we may be able to make other dates available to suit. Click here for Buttercream and Bows Terms and Conditions.